This graph is a spherical contour plot of the probability distribution of the orientation of a protein domain (regulatory light chain of myosin II) in a muscle fibre. 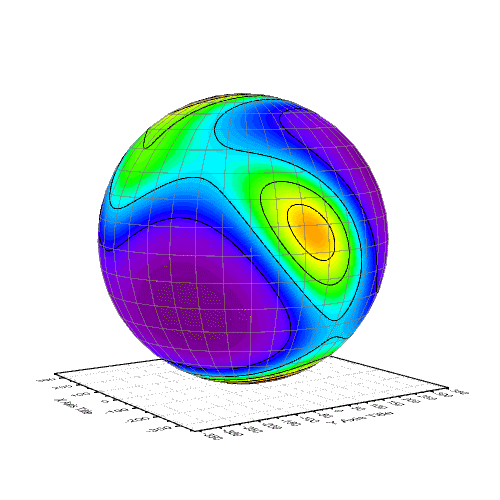 Each orientation of the domain is defined by two angles plotted as latitude (beta) and longitude (gamma) in the spherical plot. A higher probability associated with each orientation is represented by hotter colours. It contains two 3D parametric function plots: One is a 3D colormap surface plot and another one is a 3D surface without colormap and only shows the mesh line. This graph was created by Luca Fusi, King's College London. You can see the full user story in this related publication paper.